We are parents. We have each 2 kids that jsut started school. So, why did we launched kidibot.com? We wanted to find a way to motivate our kids to read and learn more. To make friends among the kids that want to read more, smart kids, with smart parents. We wanted for our kids to like in a nice positive pressure world. We said: our kids and our friends’ kids are our Guinea pigs. If it works for them, then it will work also on others. So we will be able to fulfill our objective: to change destinies. 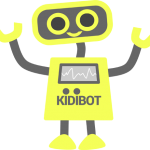 So, if you also want to be a part of this kids/parents/teachers that want more from life through reading community, we invite you to create an account on KIDIBOT. You’ll love it. How did we came up with the KIDIBOT idea? In the first grade, in 2016, my elder kid read 15 books. Not even in my nicest dreams I wouldn’t have imagine that! Why did he read so much? Because in his class there are a bunch of kids where the social pressure works extremely well. One of them read 5 books, another one read 6 books and so one. A competition where everybody won after all. We decided to create an educational ecosystem, to scale up this positive social pressure. From here to KIDIBOT was only one step. If you have any questions, feedback or requests, please tell us. We want our educational platform to help you, as a teacher, to better motivate your kids to read and learn. Any feedback from you is highly appreciated.